Gov. Chris Christie has signed a bill allowing online gambling in New Jersey. Nevada and Delaware are doing the same. 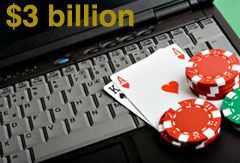 The federal government changed its position in 2011 to allow some online gaming within states where gambling is legal, but it is unknown whether the federal government will move to broaden the market. The feds need to do the same for marijuana. AG Eric Holder says he is getting ready to make a decision on how DOJ will respond to recently passed laws in Colorado and Washington. Update: Response from Bodog Brand founder Calvin Ayre. A new gambling indictment and website seizure by ICE and Homeland Security has been announced. The sports gambling site Bodog was shut down and four Canadians indicted, including founder Calvin Ayre, for illegal gambling that generated more than $100 million in winnings, federal prosecutors announced Tuesday. The website’s domain name was seized Monday and the indictments which were handed down Feb. 22, were unveiled Tuesday in Baltimore, prosecutors said. The Indictment of the 11 internet poker company executives and payment processors is only part of the story. Along with the Indictment, which was returned on March 10 but not unsealed until this Friday, the Government filed a civil lawsuit, available here, seeking forfeiture of $3 billion, as well as the company's domain names and websites. The Defendant Entities are liable to the Government for a sum of money representing the amount of property, funds, or monetary instruments involved in the money laundering offenses described above, in an amount that is no less than $1.5 billion for the PokerStars Entities; $1 billion for the Full Tilt Poker Entities; and $500 million for the Absolute Poker/Ultimate Bet Entities.